President of the Bharatiya Janata Party (BJP) Amit Shah has again exhorted party workers to work hard for shat pratishat (100 per cent) performance in Maharashtra. The BJP and the Shiv Sena have together formed a government in Maharashtra. Shah asked party workers to adopt constituencies where party nominees lost the Assembly and Lok Sabha elections last year. 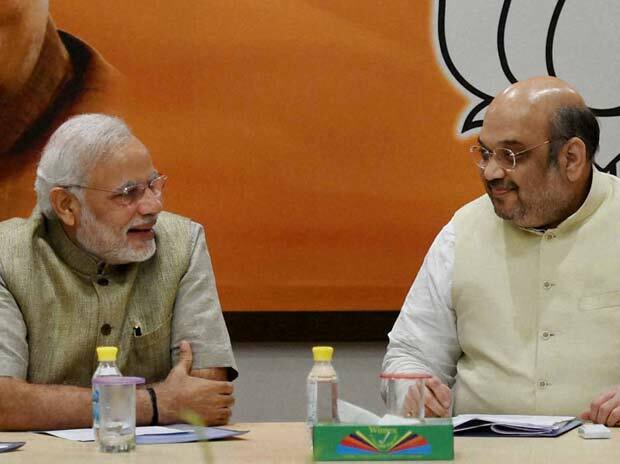 Shah indicated the BJP was geared up to further consolidate its position through its rank and file, and not on Sena’s backing. Shah’s advice comes on the eve of the Narendra Modi-led government’s completing its first year in office, on Tuesday. Elections to the local and civic bodies in the state are scheduled in the coming months. Shah has also conveyed to the Shiv Sena that it should not go on firing salvo against the government and the BJP, and that it should follow the "alliance dharma". The BJP president's call to strive for shat pratishat performance BJP comes close on heels of chief minister Devendra Fadnavis' assertion that all is well between the BJP and the Shiv Sena though the latter has been criticising the BJP on issues with regard to rising cases of farmers suicides, development of 9,900 MW nuclear power project at Jaitapur and the land acquisition ordinance. The BJP, which contested Lok Sabha polls in alliance with the Shiv Sena, won 23 seats as against 18 by the latter. Later, the BJP took a calculated risk and broke over 22-year-old alliance with the Shiv Sena to contest the state assembly elections on its own, and won 122 seats, while Sena bagged 63. Recently, Fadnavis teased junior partner Shiv Sena, saying that by going solo in the state assembly election, the BJP could assert its clout. Fadnavis has confirmed that the BJP's alliance with Shiv Sena will continue in the BrihanMumbai Municipal Corporation elections slated for February 2017. The chief minister also hinted that BJP will continue to play big brother role in the changed scenario and it is now up to Shiv Sena to take a call in this regard.